The app uses triggers to signal whether the item is a ‘Buy’ or a ‘Reject’. It will play a sound and display a message based on the result. Tap a category (1) to edit basic triggers for this category. *The Reset button (2) on the category selection screen will reset all Basic Triggers to default settings. Tap the ‘Offer to Use’ (5) to select which offer price to compare against the minimum price (8) in a trigger. * For average 3 offer price, If there are less than 3 used/new prices available, the program will average either the lowest 2 used/new (if 2 offers available), or use the lowest used/new (if 1 offer is available). If you check Ignore FBA Offers (6), the app will select the offer price only from Merchant Fulfilled (non-FBA) offers. If you also buy items without a sales rank to resell, then check No Rank (7), and set a minimum price. Tap Save (3) to save or Cancel (4) to discard the changes. Based on (5), the app will select an offer price from the item’s available offers. 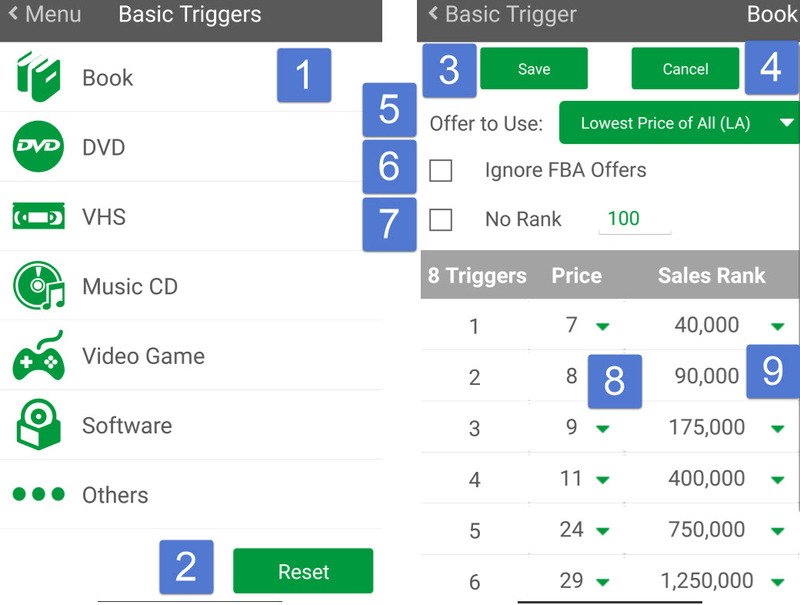 If this trigger cannot signal ‘Buy’, the app will check the trigger of the next row. The app will repeat this process until either a trigger signals this item as ‘Buy’, or it goes through all the triggers. In that case, the app will signal this item as ‘Reject’.